MyHomie Safe Space is a youth run organization that provides lowcost housing for LGBTQ youth and advocates for Party Safe practice with the Los Angeles LGBTQ T-Party Scene. • MASJ students produced a documentary with My Homie Safe Space founder, Maurice Lopez about his work in the LA T-scene. Maurice Lopez, founder of MyHomie Safe Space advocates for Party Safe strategies for youth in the Loss Angeles and Inland Empire LGBTQ T-Scene. He encourages youth to use designated drivers, security and have safe. protected fun. He celebrated this scene by holding an annual Party Crew Awards for crews that demonstrate creativity in their effort to Party Safe! MASJ students hosted the Party Crew Awards Ceremony at Pitzer College in 2009 with 150 Party Crew Youth in attendance. "Working with Moreno Loco a.k.a. the Pretty Boy King Of Hollywood and Maurice Lopez was amazing, and exposed me to a way of life I have not previously encountered. Seeing how excited people got when they earned an award made me realize that these awards really do make the crews feel special. 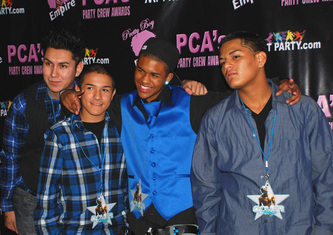 Additionally, it was quite obvious that the paparazzi and the cameras made thses groups feel like stars for the night. I was glad that i could be part of this huge production and had a lot of fun helping organize and decorate the event."